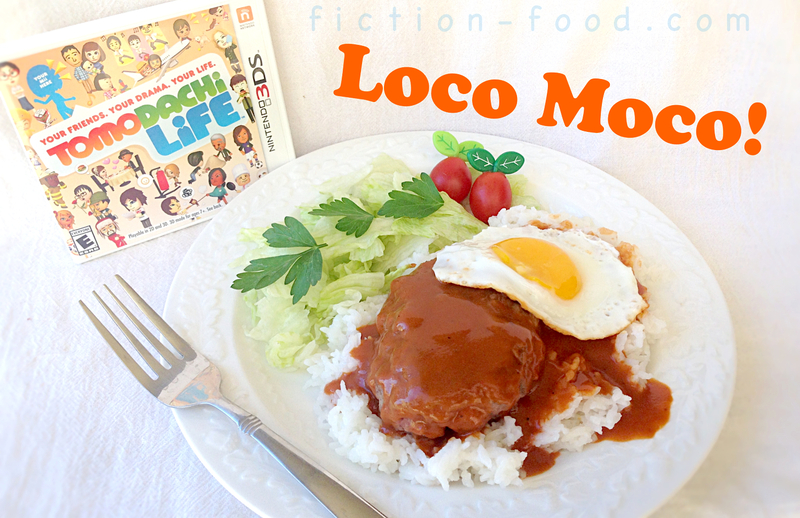 Fiction-Food Café: Loco Moco from "Tomodachi Life"
Loco Moco from "Tomodachi Life"
Nintendo's "Tomodachi Life" for 3DS is a riot of Miis and their crazy goings ons and interactions. I got a copy and gave B the code for the little free version and he got such a kick out of it that he went ahead and bought his own copy. We love checking in on our apartment buildings of Miis each day and seeing what silly things they're up to like yoga, playing WiiU, falling asleep at the counter of the local cafe, running along the surf at the beach, rolling around on the floor of their apartment, or in a rage, engulfed in flames, throwing random items at each other. Oh, there are also BBQs, a carnival, rap battles, musical numbers, and news flashes from the local news station, among other things. 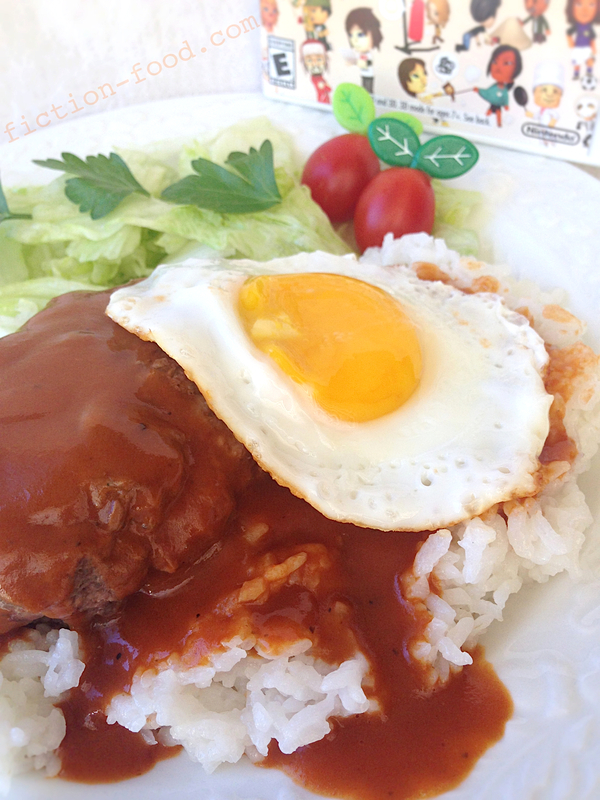 "A hawaiian dish with a meat patty, gravy, and a fried egg on white rice." 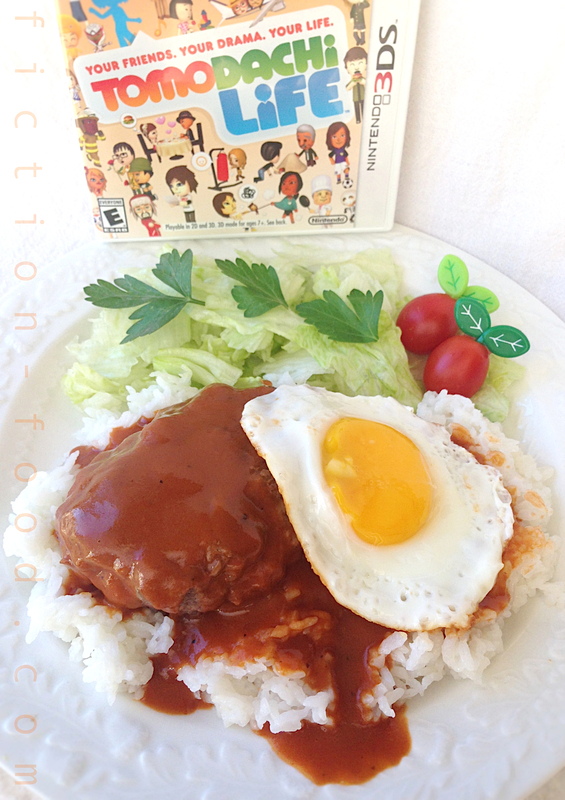 – Grocery Store Attendant, "Tomodachi Life"
Note: Often in a loco moco dish the gravy is simple and thinner than what you'll get with the recipe below. I decided to make it thicker based on the in-game image (shown above right). 1. Prepare your white rice, fluffy-style (tips here), & keep it warm (so easy with a rice cooker!) or you can have the rice cooking during the next steps. 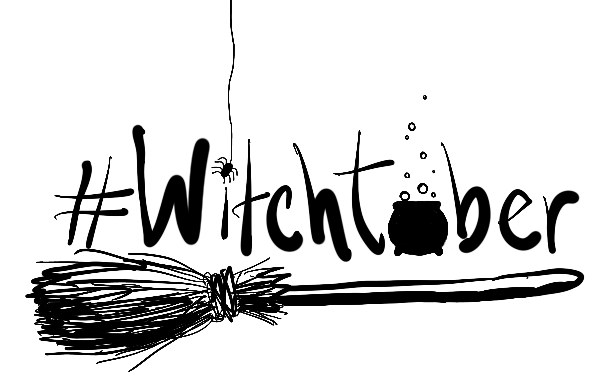 Put 2 Tbsp. of butter in a medium pot over medium heat a let cook until deep yellow in color. Add in the diced mushrooms & onion & stir. Cook for about 5 minutes or until tender & browning. 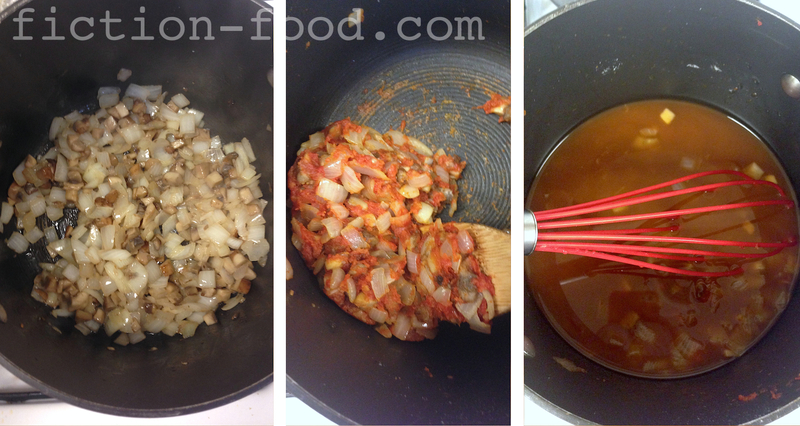 Stir in the flour until fully incorporated & then add in the tomato paste. Stir to coat well, scraping up the bits stuck to the bottom of the pot & mixing them in. Add the worcestershire sauce & sauté the mixture for a minute or 2 & then pour in the chilled beef stock (chilled helps to prevent possible lumps from forming). Bring to a boil, raising the heat if needed, & let boil for a few minutes until thickened. Turn the heat down to a simmer & cook uncovered for about 15-20 minutes, stirring occasionally so film doesn't form on the top & bits don't cook to the bottom of the pot. 2. While the sauce is simmering mix the ground beef with a little salt & pepper & form into decently-sized, oblong-ish patties about 1/2" thick. Cook in a large pan over medium heat for about 4 mins per side until juices run clear (but don't press on them!). Remove to a plate & cover with foil to keep warm (or put between 2 pie pans). 3. Strain the sauce through a mesh sieve into a medium bowl (if you want to keep the onion & mushroom bits you can skip the straining part & just leave it all in the pot). Add salt & pepper to taste plus 1 Tbsp. of butter, broken into chunks. Stir until the butter is melted & mixed in well. 4. Put a little oil in a small pan over low-med heat & crack in an egg. Corral the white so it's not all over the place & cook until no longer clear & there is just a hint of brown around the edges (sunny-side up style). Fry as many eggs as you have burgers (or for as many burgers as will be eaten during this sitting). If you don't like runny eggs feel free to flip the egg & cook the yolk. 5. 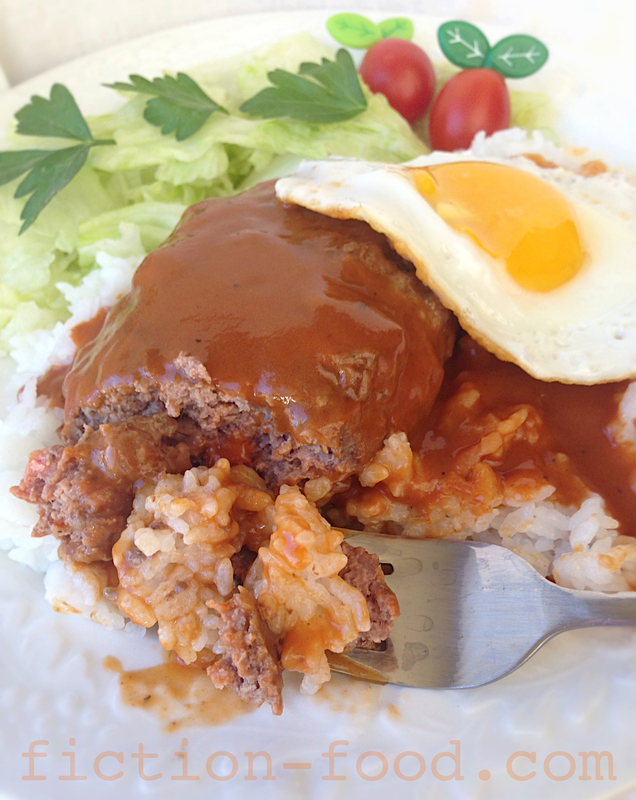 To plate your loco mocos fill half a large plate with white rice, lay on a burger, drench with sauce, & then top with a fried egg. 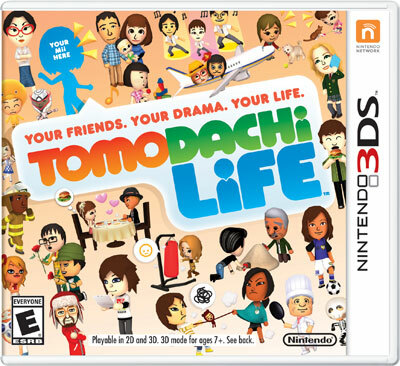 Typically the egg goes under the gravy but in "Tomodachi Life" it goes on top 'cause it's pretty that way. On the other half of the plate place a handful of torn lettuce topped with fresh cilantro or Italian parsley plus a few cherry or grape tomatoes on the side. 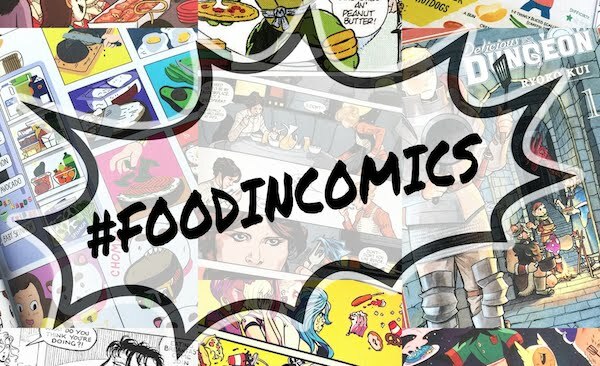 Take a bite of your finished loco moco & see if it makes you rocket into space with yumminess or melt into the floor from yuck. Hopefully you'll at least simply like it & your happiness meter will increase from a full tummy. So nice that I have just been successful with the recipe.